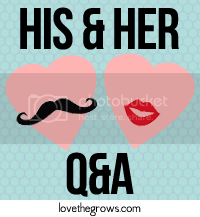 This is the last Q&A for awhile because the gal who puts up the questions is taking a break (I found her lists a bit late in the game). She said that she will occasionally put up more, so you might see some in the future. His: I look up to all sorts of people...I look up to my dad because from what I visibly see of his life, he has definitely never stopped improving. He has a lot of mental and spiritual strength and is just a good example of how to be a man and a good father. Her: I also have a bunch of people who I look up to for various reasons. One of them is my friend, Lori. She has twin girls who are six months older than my kids, and one of them has severe special needs. I am always floored at the grace that Lori exhibits as she balances doctors and therapy appointments, church ministries, and her personal life. I know she isn't walking an easy path, but her faith and attitude in spite of it is incredible! It's an honor to call her a friend! His: Turning off the lights and not handing out candy. That tradition probably won't last too much longer since we have kids now. Also, when we were kids, we ate chili almost every Halloween and that was a good tradition. If you were a fruit, what would you be? His: ....hmm.....hmm....I would go with an orange because we ate oranges a lot after playing soccer as kids. How are you like your dad or how are you like your mom? His: I think that my dad is pretty generous, and I like to think that I'm pretty generous also. I also like to think that we are both fair. His: I'm going to go with Robin Hood and The Jungle Book because I remember enjoying them immensely as a child. Her: I've always loved Sleeping Beauty and Beauty and the Beast! His: Like the Ecclesiastes verse: Two have a good return for their work and they stay warm. Her: I'm a stay-at-home mom. It doesn't pay much in the way of money, but I sure get a bunch of smiles out of it! What is something your other half does that took a long time/is taking a long time to get used to? His: Sometimes it takes my wife a long time to cook and sometimes that takes awhile to get used to. Not that it's a bad thing. She makes great tasting meals, they just take longer to cook. Her: When we first got married, Sean told me to close the toilet lid after I used the bathroom. We had no little kids in the house, so I thought that was weird, but got into the habit of doing it anyway (it's handy now that we have toddlers!). Another one is his insistence that we not eat generic brand ice cream because it doesn't "taste right." It still weirds me out not to buy that stuff (since that's what I grew up on).